Alto Beni Cacao Company is a partnership between Industrias Valverde S.A. (Invalsa) a Bolivian exporter of specialty coffee and other commodities, and Taza Chocolate, a leading craft chocolatemaker based in Somerville, MA. Our partnership began in 2010 when Taza Chocolate Founder and Managing Director Alex Whitmore first visited Invalsa Executive Vice President Jorge Valverde in Bolivia to investigate the promising, though un-developed industry in what is still regarded as an 'exotic' origin for cacao. With Invalsa acting as the Bolivian exporter, the first purchase of 2.6 tons of cacao from the Centro Integral Agroecological de Alto Beni (CIAAB), a cooperative of ~500 smallholder growers of cacao in the Palos Blancos region, was shipped in September 2010. 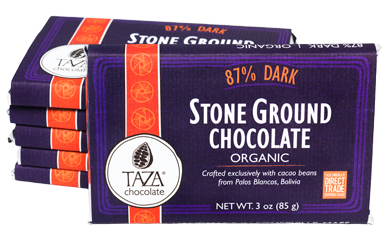 Taza uses only Alto Beni Cacao to make its 87% Dark Store Ground Organic Chocolate bar. 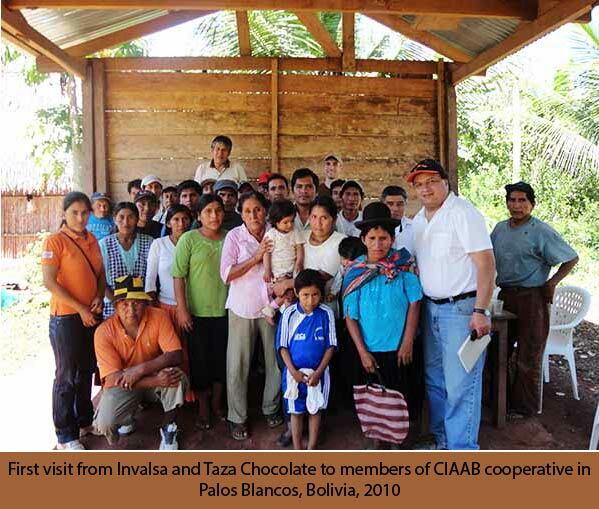 In 2012, Invalsa and Taza developed a plan to bring the Bolivian cacao industry to the next level. Until now, all cacao fermentation and drying in Bolivia are done by individual smallholder producers, using varying types of infrastructure, management, and training, resulting in inefficient overall production and varying quality levels. The plan was to construct a first-of-its-kind nursery for high-quality cacao seedlings, and centralized fermentation and drying facility in Palos Blancos. This facility would be based on similar plants in Ecuador, Peru, Mexico, and the Dominican Republic, where cacao production levels are significantly higher than in Bolivia. The plant would be developed in tandem with a training program for CIAAB cacao producers on how to sustainably increase their levels of planting. This system would allow for farmers to increase their farm productivity and incomes, while allowing for consistently high quality of dried cacao. In August 2012, the Invalsa-Taza partnership was awarded a grant through the Dutch government's Private Sector Investment (PSI) Programme to support innovative investments in developing countries that will create positive social impact through foreign private investment. Construction is now underway, the project has been named the Alto Beni Cacao Co., and planting of the first nursery seedlings were in June 2013. The fermentation facility is expected to be operational for the 2014 harvest.